The RIDGID Beast 10 in. Tile Saw is just as the name implies. 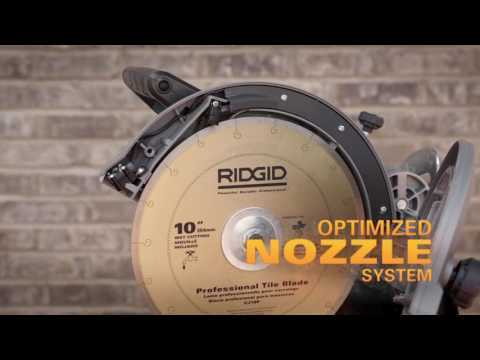 This saw can rip through the toughest materials such as natural stone, pavers and porcelain. It can rip through 34 in. large format tile and 24 in. tile on a diagonal. Combining a laser guide, optimized water nozzle system and miter guide equates to having cleaner and more accurate cuts. Max Tile Cut Side Diagonal 24 in. 10 in. 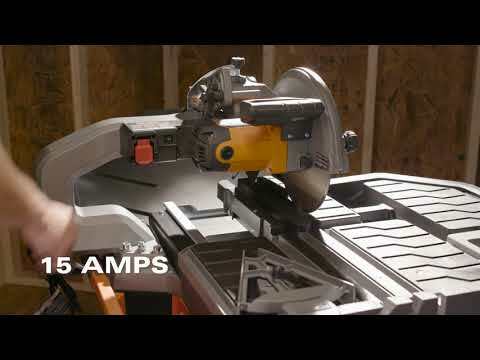 Wet Tile Saw with Stand is rated 3.0 out of 5 by 5. Rated 5 out of 5 by JerryK from TILE SAW PERFECTION....LITERALLY!!!! There is nothing I would change in the design of this wet saw with the exception of adding a LED work light. The laser is very bright and can easily be used under daylight conditions. The table is a clever design that enables 34inch rips/through cuts......the yellow black and decker dewalt does not come close to the build quality, feature set nor does it come with a gravity stand (a scissor stand that after paying 800, you have to pay more for that) as the Ridgid does It was set up perfectly out of the box and the blade cut clean chip free cuts. I highly recomend this saw and included gravity stand to any pro tile contractor. Rated 1 out of 5 by Suncountry1 from Not worth the money The saw stayed true for about 2 months. I fixed it only to have it keep slipping out of square. Then the slide try started to stick to the point of breaking tile. I took advantage of the lifetime warranty only to have my saw miss placed for 3 weeks. I got it back almost 8 weeks to the day of dropping it off. It was never fixed and covered in grease. Rated 5 out of 5 by Davids from This saw it Is clearly the true beast, it performs as well as they say if not better. I looked at a lot of wet saws,, this one was perfect for my fit,, it cuts perfectly. Diagonals perfectly, you could not get a better so I believe for an all-around contractor/Handyman/ Builder. I give this beast the Five star review because it is a five star product.